The Dorchester office of Hawksmoor Investment Management was very proud to support the Cerne Abbas Music Festival concert on Thursday July 26th at St Mary’s Church in Cerne Abbas, Dorset. The Festival was founded in 1990 by Richard Hosford, leader of the Gaudier Ensemble and resident of Dorset. He was looking for a location that gave the musicians an attractive venue in which to perform, and where they could all be together for a week to play the music they wanted to play, at the highest artistic standards. 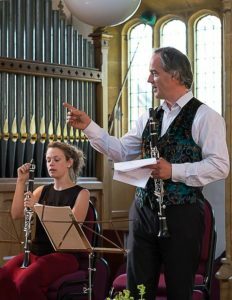 He wanted to develop strong links with the community, provide accessible music to the people of Dorset and create a stimulating environment for local young musicians and children. Cerne Abbas was his chosen location, partly because of the excellent acoustics of the Church but also because of the village and its community. The programme for the evening of Hawksmoor’s sponsorship included Debussy, Francaix, Poulenc and Mozart, and allowed the audience to enjoy listening to chamber music performed by one of the world’s elite Ensembles. More information about the Cerne Abbas Music Society can be found on their website.